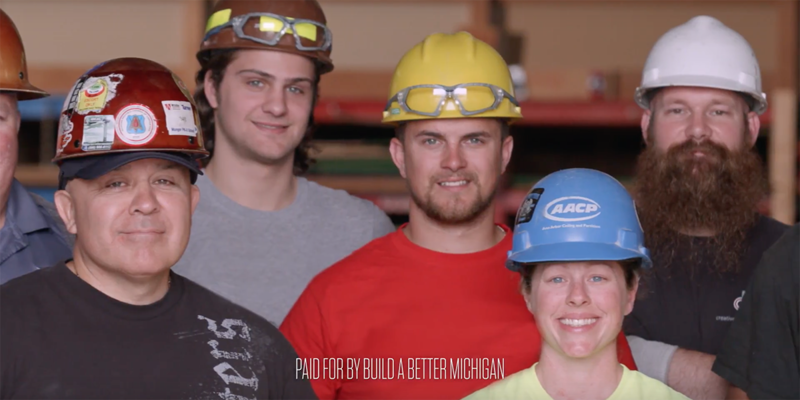 Gretchen Whitmer, a former state Senate Minority Leader and the frontrunner for the Democratic nomination for governor, is featured in a new advertisement paid for by Build a Better Michigan, a political organization backed by supporters but that does not explicitly advocate for her candidacy. Abdul El-Sayed, a former Detroit health director who is running as a Democrat to be Michigan’s next governor, has issued a statement alleging that one of his primary opponents, Gretchen Whitmer, is using a “corporate dark money PAC” to help her win an election. In the new ad, Whitmer, a former state Senate Minority Leader and the presumed Democratic frontrunner for governor, tells viewers that Michigan needs to invest in skills training and repeal a Snyder-era tax on some pension income. Build a Better Michigan, which is legally independent of the Whitmer campaign, will have to release details of its contributions and expenses to the federal government, not to the state. But the committee’s first filing deadline is not until next month, meaning that no data are yet publicly available about its donors. Michigan Truth Squad finds El-Sayed’s claim to be half accurate. It’s led by Mark Burton, who was Whitmer’s chief of staff during her tenure in the state Senate. Burton said the group’s top issues include skills training, K-12 education and access to affordable health care. Build a Better Michigan plans its ad buy over a five-week period, starting with the Detroit, Flint and Grand Rapids markets, Burton said. Nowhere in the initial 30-second spot does the group explicitly encourage viewers to vote for Whitmer in the Aug. 7 primary. Why does the ad tiptoe around endorsing Whitmer? In Michigan, a federal 527 organization is not required to report finances to the state if their ads avoid telling voters who or what to vote for, said Fred Woodhams, a spokesman for the Michigan Secretary of State. Craig Mauger, executive director of the Michigan Campaign Finance Network, a nonpartisan nonprofit, said political organizations that fall outside of Michigan’s campaign finance laws — like 527 organizations — can coordinate with candidates if they don’t directly advocate for or oppose their candidacy. That could explain why Whitmer is appearing in Build a Better Michigan’s ad. Federal requirements are different: 527 groups have to report details of their donors and spending to the IRS, though they’re only required to list names and addresses of donors who give at least $200 in a calendar year. Burton told Truth Squad the organization will make its first quarterly report to the IRS, covering the three-month period from April 1 to June 30, by July 15. Adam Joseph, El-Sayed’s campaign spokesman, said the campaign has not yet seen details of Build a Better Michigan’s finances. But he contends the organization was created to promote Whitmer as a candidate. (A claim also made by the Michigan Republican Party, which filed a complaint Wednesday with state election officials.) And Joseph notes that a 527 allows candidates like Whitmer to benefit from unlimited amounts from corporations that wouldn’t otherwise be allowed to donate directly to a candidate’s campaign, while also shielding from public view the original source of some contributions. Corporations can’t donate directly to candidates for office in Michigan, though they can give to super PACs supporting a candidate. State campaign finance law limits donors to individual candidates running for governor to a maximum of $6,800 for each election cycle. “Campaigns like Sen. Whitmer’s use 527s for two reasons: first, to take unlimited amounts of corporate money, and second, to launder donations through other PACs, dark money accounts, and other sources,” Joseph told Truth Squad in an email. “And because we don’t know where any of the $1.8 (million) ‘Build a Better Michigan’ is spending to advertise for Whitmer is coming from — it is dark money. Whitmer’s campaign notes, correctly, that it is a separate legal entity than Build a Better Michigan. The campaign also takes the position that Whitmer was invited to appear in its ad to promote various issues, not her candidacy. Burton declined to voluntarily disclose the group’s donors ahead of the July filing deadline. “Our intent has always been, and will continue to be, to follow the letter of the law regarding both contributions and expenditures,” Burton said. Michigan and national campaign finance experts told Truth Squad that political groups such as 527 organizations are not inherently dark-money organizations. As noted, they are required to report their contributions and spending. But there are ways these groups can be used to funnel dark contributions. One example is nonprofit social welfare groups, such as civic groups organized under Section 501(c)4 of the Internal Revenue Code, said Pete Quist, research director for the Helena, Mont.-based National Institute on Money in Politics. Because the IRS doesn’t recognize social welfare groups as a political organization, they don’t have to publicly disclose their donors. Yet 501(c)4 organizations can get involved in politics, usually through ad campaigns, and are unlimited in both who can give to them, and how much, he said. If a 527 political organization accepts money from a 501(c)4 nonprofit that doesn’t have to disclose its donors, Quist said, “the trail pretty much runs cold from there.” The civic group will be listed as a donor to the 527, but that doesn’t tell the public much about who is funding that civic group. Quist said El-Sayed’s statement that Build a Better Michigan is a vessel for dark money “may not be technically accurate” because it hasn’t yet disclosed its donor list. It’s simply too early to tell. Says a pro-Whitmer political group is paying for a TV ad campaign with dark money. Build a Better Michigan is not in itself a dark-money group because it is required under federal law to disclose its finances. Whether it has taken money from organizations that don’t disclose their donors remains unclear. The group says it won’t voluntarily list its contributions ahead of its first IRS filing deadline in mid-July, and notes correctly that it’s not required to do so earlier. Yet campaign finance experts say 527 political organizations, like Build a Better Michigan, often take contributions that can’t be traced back to the source. So while El-Sayed’s statement may be unsupported (at least for now), the criticism often leveled at 527s has merit. El-Sayed’s campaign would have been on firmer ground had it said a pro-Whitmer organization could be used to take in dark-money contributions, rather than asserting — before data has been publicly released to back it up — it already has done so. El-Sayed calls the Whitmer-linked 527 a “dark money PAC” without waiting to see who gave it money. The 527 fuels that suspicion by declining to provide donor names until legally required to do so. Whitmer’s campaign, meanwhile, says with a straight face that an ad she narrates that highlights her legislative history is all about the issues, and has nothing to do with her race for governor. Truth Squad calls this statement half accurate. This rating will be reevaluated in July when the 527 donors are revealed. With a 527, it's dark money by default because we do not know where the money comes from. Then, that begs the questoin – if it's just benevolent individual donations, as it claims they could be, then why wouldn't people just donate straight to her campaign? Why form the 527 in the first place? It's a politics that's not transparent and it's a politics that we're deliberately trying to move away from. The reason you contribute to a 527 instead of a campaign is that a 527 is an issue advocacy group, not a campaign organization. As an individual or PAC, you are limited to $6800 in contributions to a Gubernatorial campaign. A 527 isn't for campaigns, but rather social welfare issues, so it is allowed unlimited contributions. By appearing in a "non campaign" related ads, she gains the benefit of name recognition and association with policy solutions. Some 527's are really just for issue advocacy, and have nothing to do with elections, but candidates find them a useful mechanism to magnify the power of their fundraising base. For example, a 527 can make an ad advocating "Medicare for All" the Ad isn't for a candidate, it's for healthcare. However, by appearing in the "Medicare for All" ad you get the people of the state to know you support Medicare for All without having to spend legally limited campaign money on it. I roll my eyes any time anyone feels the need to mention that they are following the letter of the law. Following the letter of the law means they are stuck on semantics, looking for loopholes and we should be very concerned that the intent is to get away with as much as they possibly can without crossing a legal line. Ethics are concerned with the spirit of the law. We all know what the law intended - a fair playing field. Transparency. That is why Abdul is my candidate. Because we need ethics, not establishment political games with or without dark money (but especially not with!) in our government for once. Indeed. Abdul is my man. Im sick of these corporate dems ignoring the will of the public. This state went for Sanders, yet our superdelegates weny with Hillary anyway. And now they are throwing their weight into another corporate garbage candidate in Whitmer. Let's try to remember this 'corporate garbage candidate' as you are pleased to call her may well be the Democratic nominee for governor. So please try to make your arguments without trashing our own candidates before the Republicans can even get to them. Because otherwise one has to wonder which side you are on, exactly. The Democrats or the Republicans? Mike, that exact "logic" of yours is exactly what is wrong with the democratic party. Blindly be loyal to the letter next to the name, rather than the person. These people represent us. That is their job. The idea that you cannot criticize a person because they are on your "team" is completely unreasonable and downright stupid. Those are not the rules. The MDP was happy to feed anti-Abdul fodder to the Republican trolls with the whole eligibility waffle. As for me, I'm not "on" either side. Being an independent voter means I don't have to pay lip service to anyone, thank you very much. Karma hurts sometimes, doesn't it? PS. To anyone who is fed up with corporate money in politics, she is a garbage candidate. Deal with it. You are the exact reason I am voting for Calley in the upcoming Republican primary. I would rather spend my time voting for a candidate I believe in, but we cannot afford to have Schuette as the governor of Michigan. While I believe Whitmer will eventually be the best choice to run and win against any of the Republican offerings, your perfection at all costs attitude and recent history has me concerned that you would not turn out even in the event a Trump like individual were the opposing candidate. In short...even a party member does not have to pay lip service to a closed minded perfectionist independent. p.s. I hope others with similar worries may consider joining me in extinguishing the Trump fever dream by backing less radical Republicans in the primary only. Calley, the guy who is complicit in poisoning an entire city, is a less radical republican? God help us. Michigan Attorney General Schuette declined to hold him or Rick Michigan legally accountable. He saw the same evidence as you ...had the power to do something about it and punted. Agnosticrat, great, go for the strategic vote. More power to you. It may not produce the outcome you expect, though. El-Sayed vs Calley sounds like a good matchup to me. I know some people who followed your strategy in 2016 by voting R in the primary to "stop" Trump, presuming that Clinton would not face a serious challenge. Obviously she still lost both statewide contests, but have at it. Personally, I will be voting for Calley if he faces off against Whitmer. An honest, moderate conservative is better than a pandering, moderate Democrat in my book (at least Calley doesn't pretend to be progressive). For Whitmer vs. Schuette, I would vote 3rd party. Ah, the joys of being independent. Exactly!!! People who treat politics like a sport and root for their team no matter what they do are what is wrong with politics in this country. Wake up and think for yourselves!! Neoliberals who take corporate cash don't give a darn about you. Its not just the letter of the law, its really standard campaign tactics. Abdul has choosen to self handicap his fundraising and campaigns finances because he promotes the message that our campaign laws allow big donors and other financial influencers too much power and this can be corrupting. Refusing this money is generally good early publicity and of little cost to a candidate with few wealthy supporters. It is a technique for outsider candidates. Forgoing money that you aren't getting anyway to get your message out will garner support from percentage of voters to whom it is messaged, is a good strategy for an outsider candidate. Traditional campaigners would argue this purity tests requires that Democrats bring a knife to a gun fight. No matter how much Democrats spends on a 527, the Republicans will outspent them 5 or 10 to one, So a Traditional campaigner says spending money promoting a Democratic Agenda while simultaneously gaining name recognition is smart politics. If you've got rich donor's and a strong moral compass, then use every legal resource available to you, because the Republicans will still be outgunning you. In my (cynical) opinion, both candidates are simply employing smart strategies which reflect the realities of their campaigns. After watching him the other night he is an arrogant egotist.. I do not want another inexperienced layman trying to run this state. Just because you don't take money from someone does not mean you are close to being the best person for the job. Yea, what it does mean is that you have no obligation to your donors, so you work specifically for the people you represent, first and foremost. Unlike Whitmer. This isnt a hard concept to grasp. He is endorsed by Our Revoluton and take their money. Our Revolution is a 501c4 which is a doesnt disclose its donors. Over half his donations are from out of state. He may not be "influenced" by corporations but he sure isnt influenced by Michiganders. Why is he so happy taking so much money from out of state? I submit that this 527 has gone beyond what is normal for an "issue ad" because the ad contains video of Gretchen Whitmer with accompanying text "Candidate for Governor". 527's are supposed to advocate for an issue but not a candidate. Whether or not the letter of the law/regulations were followed, this ad is certainly not in the spirit of an "issue ad". I'd rather see Gretchen on stage for more debates with Abdul and Shri, especially in the U.P. and the northern lower peninsula where voters can here for themselves from the candidates. I have already decided I am voting straight democrat-and not for this guy...oh no-on my behalf-I'm a animal lover-and he is not-in fact that makes the decision all that much easier-that is one of the top 2-and the #1 being I just don't care for him. I think you are confused Patti C.
Abdul and Shri arent the same person. I find these ads a pleasant change from the actual dark money ads from Americans For Prosperity, a Koch Bros subsidiary, which blanket the local airwaves and attempt to harness Whitmer to Jennifer Granholm, who they falsely blame for the failure of the Bush administration and the collapse of the auto industry during the Great Recession. Let's get real about politics, people. There is money, money everywhere because there is so much at stake. It is a very troubling sign when "good" dark money is seen as a welcome relief from "bad" dark money. This sort of brinkmanship is exactly the problem with the massive Citizens United loophole which allows regular contribution limits to be bypassed as long as there is no "coordination" with a specific candidate. The ads are clearly promoting Whitmer, but can claim otherwise based on some vague legalese. That is deceptive, plain and simple. The fact that a 527 was formed to help her campaign indicates that she has not been successful in raising donations from individuals, which suggests she is an ineffective candidate. This is a show of desperation and does not bode well for the general election if she should win in August. Money is NOT everything. Standing on principle would be the preferred approach. Consider the election outcomes from yesterday. Progressive values CAN win, even without dark money. I heard the rehash of this just now on WDET. Again, you left out that there are graphics in the ad saying Whitmer is running for governor. The report notes a "July deadline" but never mentions that it's come and gone and we still don't have the data. Why? BaBM did not file electronically, literally mailed it in. I think a reasonable interpretation is that they want the list of donors hidden as long as possible.